Identity/Class: Unknown - could be a human mutant, a normal human who just happens to be plagued by ghosts, or somehow mystically empowered. Powers/Abilities: Somehow Major Liberty could summon the ghosts of American patriots. These ghosts would aid him in his missions. History: (U.S.A. Comics #1-4, ga) John Liberty was so angered at hearing of the sabotage missions of Axis agents that his anger drew the ghost of Paul Revere. 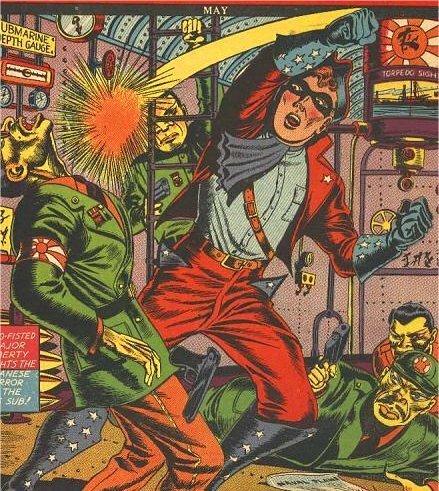 The patriotic spirit judged that John made him a worthy agent himself, and transformed him into the costumed Major Liberty, charging him with combatting Nazi threats to America. Comments: While it seems that Major Liberty could summon ghosts, it wasn't clear whether these really were the spirits of the dead, or if he had some sort of power that manifested itself in this form, shaped by his interest in American history and rage against the attacks on the U.S. And if they were real ghosts, was it some ability of John Liberty's that summoned them, or some outside force? 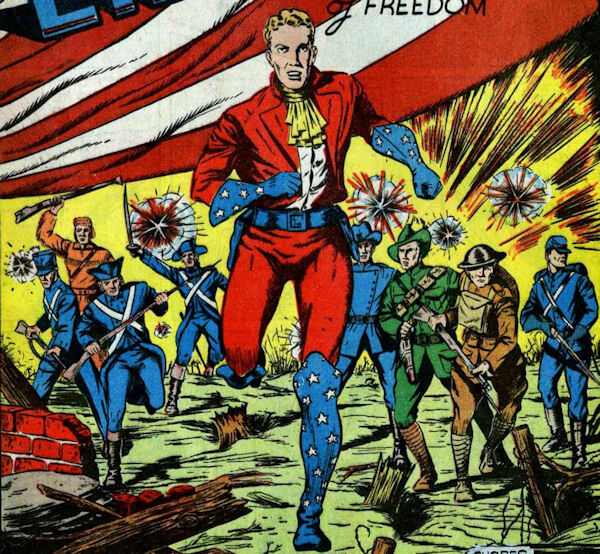 While he hasn't appeared in the modern era, Major Liberty's existence has been confirmed in the current Marvel universe when his name turned up on a list of patriotic heroes in USAgent #3. Thanks also to Ron Flick, who informed me "Major Liberty was known as Mister Liberty in his first appearance in USA Comics #1. He did not become known as Major Liberty until issue #2." Thanks also to Xavier Fournier for corrections.